The SMW-HR high resolution weighing indicator and controller is a very flexible digital load cell indicator and display system in a bulkhead mounting format, optimised for single or multiple load cell and weighing applications. The digital architecture offers very easy one-pass calibration and fast setup. This versatile weighing indicator and controller offers options of isolated analogue outputs, latching relays or digital outputs for control or alarm functions. This SWW-HR version of the weighing indicator and controller incorporates a very high resolution (24-bit) A-D converter and therefore offers an internal resolution of 500,000 counts. This additional performance on the SMW-HR is of benefit for multi-range scales and for applications where the live weight is very small in relation to the dead weight (tare weight). 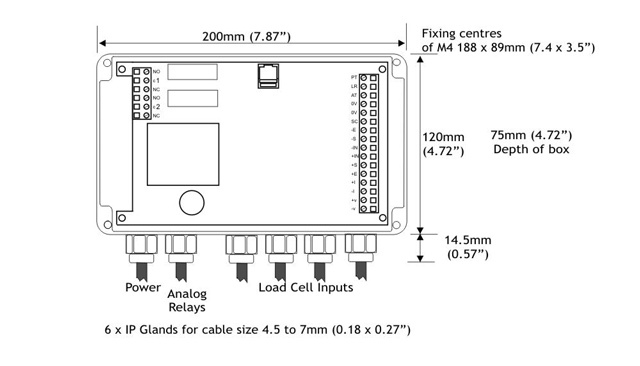 For a wireless telemetry version, see models T24-SO and SERIALDIS remote digital display module. The SMW-HR is a PCB is a High Resolution load cell input module, Expanded RAM, CPU and 4-20mA/O – 10V Analogue Outputs which can be either ABS Cased or Din Rail mounted. Starting with the Base Unit select the SMW-HR you require followed by the options you need to configure the device to meet your needs. Q: How long will it retain and protect my data? A: 10 years for set values, minimum of 10,000 write cycles.